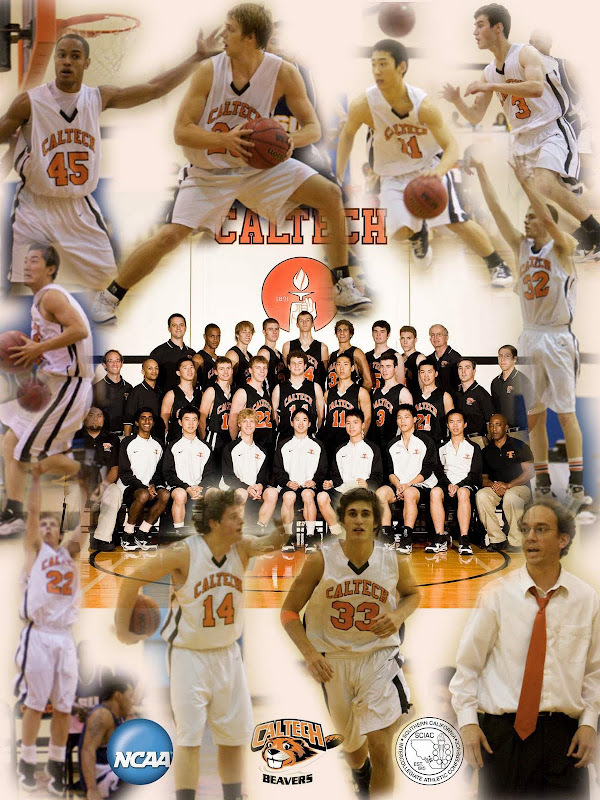 Periodically, CxB3 presents posts by alumni and friends of Caltech Basketball. Mr. Yang graduated from Caltech in 2009 with a degree in Biology. While playing basketball for the Beavers, he also served as a contributing writer to The Tech, the campus newspaper. Despite however much we worship the stars of the game, such as Kobe or Lebron, and laud their individual heroics, basketball is a team game. During game four of the NBA Finals last year, Phil Jackson used Bryant as a decoy on the last out-of-bounds play in regulation. Bryant dove towards the ball in order to draw the double team, caught it, then ping-ponged the ball right back to inbounder, Trevor Ariza, who had zipped down the sideline. Ariza then whipped a pass to Derek Fisher on the other side of the floor. As we all know, Fisher hit the wide open 3-pointer to send the game into overtime and the Lakers would go on to win the game and the championship. Three Lakers. Three passes. Six seconds. Two players voluntarily passed to teammates in a better position to score. In basketball, plays like that are fairly common, especially on winning teams. Each coach has his own word for it: teamwork, unity, ubuntu. Whatever one calls it, cooperation is key to winning basketball games. In a recent UC Berkeley manuscript, the authors found that the best NBA teams touch each other more. Why? According to the researchers, in other primates like chimps, adults spend up to 20 percent of their day grooming each other. The constant touching is a sign of mutual cooperation. In humans, touching (a handshake, a high five, a friendly punch) may build the same bonds. When I fist-bump a teammate as we're walking onto the court, it may send the message "Hey, bud, next time you're open in the corner, be ready for the kick-out and drain the three. Also, you have the ball and I'm open in the post, dump the ball down low." And it’s all communicated without speaking a single word. The answer is 239. In this case, Nash does seem to build trust and cooperation through his numerous high-fives. Is there any wonder why the Suns went 60-15 with him (and were only 2-5 without) during his first MVP season? A lot of blogs have featured the Berkeley study and just presented the conclusions at face value. "Touch each other more during games and you'll play better!" But is that really what was concluded in the study? The paper mentions many ideas, but the main claim is that better bonding between teammates produces better team results. Touch is a proxy for bonding because it’s important in building trust and cooperative bonds. Right off the bat, I have to say that one concern I always had with social science papers is the lack of experimentation. It's not because social science people don't understand how to conduct experiments. Often, experiments are just impossible, and they require the ability to manipulate variables -- while holding all other possible interfering factors constant. In this case, no NBA team in their right mind (well, maybe the Clippers) would allow some experimenter to mess around with team chemistry even if the authors knew exactly how to strengthen or weaken team bonds. In other cases, its often unethical. For example, one can't take twins and coddle one while mistreating the other to see how nurture affects success – that is child abuse. But, back to our original point: without experimentation, the best the authors can show in a paper is that two variables -- when observed in the real world -- are often found with each other and tightly correlated. The tighter the correlation, the more likely there is a real relationship between these two variables rather than just random chance. Even before all of that, they had to find a way to measure touching and team performance. For touches, it was as simple as sitting someone down and having him note whenever two players of the same team touched. This included "fist bumps, high fives, chest bumps, leaping shoulder bumps, chest punches, head slaps, head grabs, low fives, high tens, full hugs, half hugs, and team huddles." Notice these touches come outside of normal basketball plays, so screens and fighting for rebounds don't count. As we all know, a good screen sets players free for open shots. In order to pick off the defender, a good screener usually rubs shoulders with his teammate, while bad screens don't result in any contact ("screening the air"). If screens are counted as touches, the conclusion might as well be winning teams set good screens, while losing teams set bad ones. As for team performance, it might surprise people that the authors didn't use total number of wins for each team. Instead, they used some statistics not found in a normal box score: offensive and defensive rebounding efficiency, assist ratio, rebound ratio, win score and NBA efficiency. This may surprise some people since, in practical terms, winning more is more often associated with performing better in basketball, but these statistics seem to predict future performance more effectively than total wins. That is because a lot of basketball analysis is done with knowledge of probability theory in mind. To statisticians, two teams playing a game is nothing more than a coin flip. Good teams maximize their probability to win, like weighing a coin to come up heads 90 percent of the time instead of 50 percent. Why look at teams this way? As one knows, with a normal coin, once in a while, the toss will get nine out of ten heads in a row (much like a .500 team goes on a long winning streak). Does that mean the coin will start flipping heads more? Now that would be a neat trick. Instead of looking at how many heads versus tails came up in the past, a more accurate way to predict future coin flips is to measure where the center of gravity is in the coin. Rebounding efficiency, assist ratio, win score and NBA efficiency are supposed to be a basketball team's equivalent of the coin's center of gravity. But is playing a basketball game really as random as flipping a coin? It's too deep of an argument for this blog post, but I will say these statistics predict more winners in playoff series than just picking the team with a better record. However, even with the low p value, it’s still difficult to conclude that closer bonding leads to better performance. For one, number of touches measured may not be a good indicator of team bonding. One point the authors missed is that regardless of bonding, better teams produce more high-five worthy plays – that is how they win. More touches equals more good plays, so good teams -- regardless of how well they bond -- will have more opportunities for touches. I would love to see something more nuanced. I think better bonded teams will congratulate each other more for each good play. I would like to see measurements such as "high-fives per dunk" or "chest bumps per clutch defensive stop" and how they correlate with team performance.